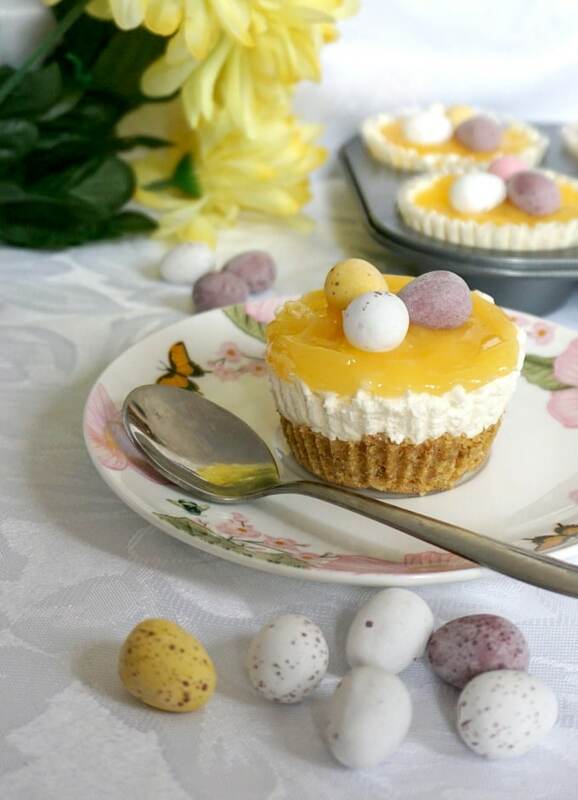 My mini lemon cheesecakes are the best dessert for Easter. The bite-size treat has such a mixed range of textures and tastes. The base is crunchy, yet crumbly at the same time, while the cream cheese filling is rich, soft and sweet, and the lemon curd brings sharpness and freshness. And then you have the chocolatey mini eggs. Can it get any better than this? Easter is definitely my favourite big holiday of the year. When l think of it, l think of Spring, sunshine, long bright days, green grass, nature reborn, birds singing. And of course, the Easter bunny and coloured eggs. There are so many nice culinary traditions, that it is hard to choose which one is the best. 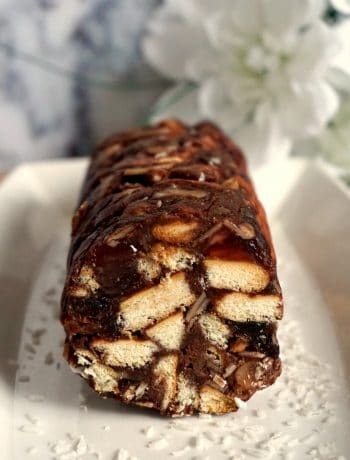 Each country will have its own favourite Easter treat, but I some desserts can be pretty international, which means everybody gets to enjoy them. These mini lemon cheesecakes do not require too much effort. You do, however, have to be patient and leave them to cool and settle in the fridge for a few hours. In this way, you get the very best flavours and texture, but then the waiting is totally worth it. How do you make mini lemon cheesecakes? The recipe is pretty basic, nothing you wouldn’t expect from a basic cheesecake. You have the digestive biscuit/Graham crackers base, then the cream cheese filling, and to give that final wow factor, you top it with the most delicious lemon curd. To make the base, either place the biscuits in a bag and use a rolling pin to crush them, or add them to a blender. 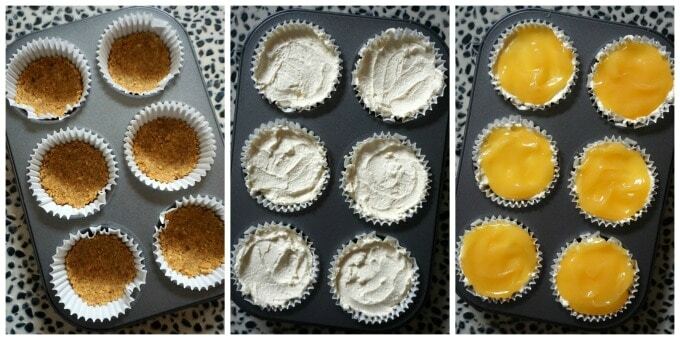 Add the melted butter and mix well, then divide the mixture between the muffin tin cases. 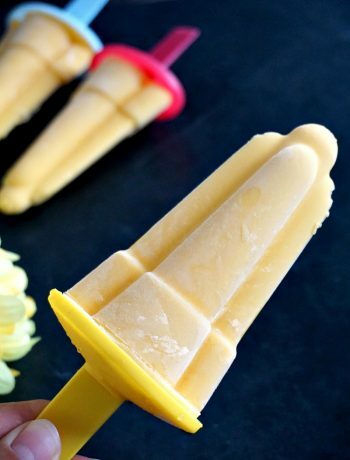 Refrigerate for at least 30 minutes so that this can firm up. To make the cheesecake filling, beat up the double (heavy) cream until it holds stiff peaks, add the soft cream cheese and vanilla extract, and top each biscuit base with the cream. You can swap the double cream for mascarpone, that should not change the texture of the cheesecake. How do you make homemade lemon curd? Now, I kid you now, this is THE BEST LEMON CURD EVER. It’s just phenomenal with anything creamy, silky and sweet, like the cream cheese filling, or a nice meringue, like in my Meringue Nests with Lemon Curd. It’s super easy to make it at home, but then it you want a shortcut, or just don’t have time for it, you can surely cheat a tiny little bit and buy a nice jar of lemon curd. But, the homemade curd is even better. Set a pan over a pot of simmering water, making sure the water does not touch the base of the pan. Add the butter, sugar, lemon zest and lemon juice, and stir until the butter is melted. Beat the eggs lightly, add them to the buttery mixture, and continue to stir until the curd thickens, it should not take longer than 20 minutes max. Leave the curd to cool down completely before topping the cheesecakes. And since we talked about patience with letting the mini lemon cheesecakes cool, you must not dispair, just about 3-4 hours should do. Do use the paper cakes, as they will be a lot easier to remove from the muffin/cupcake tins. Plus they get a nice shape too. Make sure the lemon curd is not runny, but pretty thick, you want it to top the cheesecakes nicely, otherwise it will just go everywhere when you remove them from the tin. You might want to thicken it with gelatine in case it’s thinner than needed. The cheesecake filling shouldn’t really need gelatine at all, it does set pretty nicely in the fridge if left to cool for long enough. Don’t go crazy with the amount of sugar you use, I personally find that the cheesecake filling doesn’t need more than 1-2 tablespoons of sugar, but if you like it sweeter, by all means, you can use more. And that’s that, a super yummy Easter dessert for little and big tummies. Enjoy, you are in for a treat! If you’ve liked my MINI LEMON CHEESECAKES or any other recipe on the blog then don’t forget to rate the recipe and let me know how you got on in the comments below, I love hearing from you! You can also FOLLOW ME on FACEBOOK, INSTAGRAM and PINTEREST to see more delicious food and what I’m getting up to. 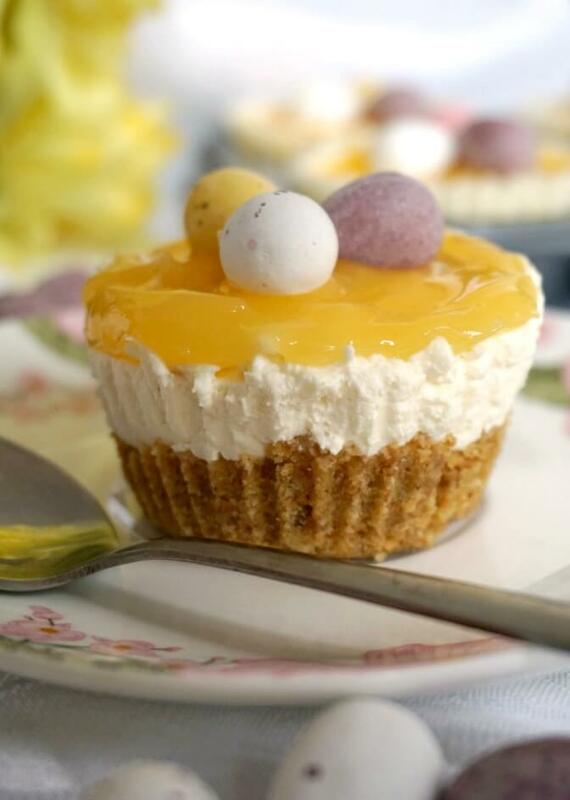 My mini lemon cheesecakes with Easter eggs are the best dessert for Easter. The bite-size treat has such a mixed range of textures and tastes. The base is crunchy, yet crumbly at the same time, while the cream cheese filling is rich, soft and sweet, and the lemon curd brings sharpness and freshness. And then you have the chocolaty mini eggs. Can it get any better than this? Place the digestive biscuits in a bag and use a rolling pin to crush them. Melt the butter, either in the microwave or over a saucepan of simmering water. Mix the butter and the biscuits using a silicone spatula. Line a muffin tin with paper cases and divide the biscuit mixture evenly between each mould and refrigerate while you get on with the cream filling. Meantime, use an electric mixer to beat the double cream until it holds stiff peaks, then add the sugar and cream cheese and beat until fully incorporated. Top the biscuits base with the cream cheese mixture, so that each cheesecake is about 2/3 full. Refrigerate again. To make the lemon curd, cut the butter in small cubes and place it together with the sugar in a heatproof bowl over a pan of simmering water, making sure that the water does not touch the bottom of the pan. Add the zest and juice from the 2 lemons and stir occasionally until the butter is completely melted. Beat the egg and egg yolk slightly, then add the egg mixture to the pan, whisking well. Leave to cook for about 15-20 minutes, stirring occasionally, until the lemon curd coats the back of the spoon. Set aside and leave to cool completely. The lemon curd can then top each of the cheesecake. 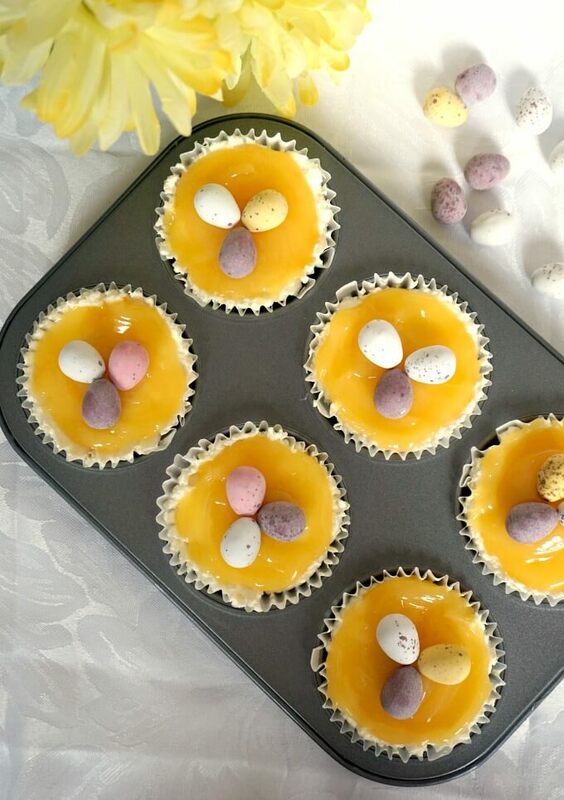 Decorate the cheesecakes with chocolate eggs. Click on the US Customary link (underneath the ingredient list) to see the measurements displayed in cups and ounces. How adorable! I love the idea of having these little cheesecakes for Easter when we want just a little bit of sweets after a big dinner. Thank you very much, Julie ? Thank you – portion-controlled treats! How many lemons do we use? The ingredient list says 1 lemon and the instructions say “the 2 lemons.” Looks yummy, thanks! Hi Lillie, thank you for your comment! There are 2 lemons, sorry for that, I have just updated the post now. 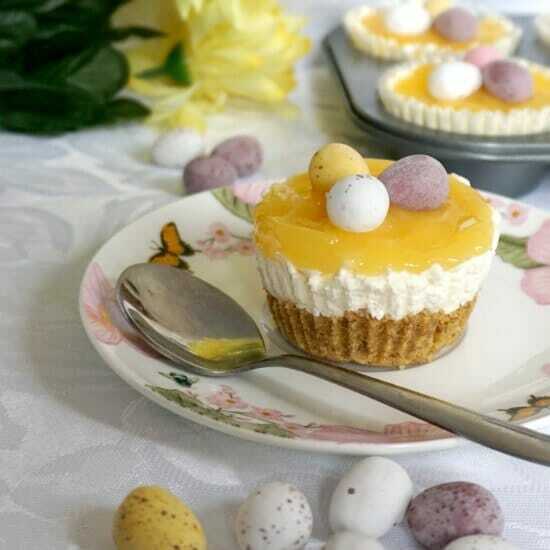 The cheesecakes are very yummy, and they are a great treat for Easter. Hi is this no baking involved? Not sure what leave to cook means. Hi! Thank you for your comment! Yes, it’s a no-bake dessert as no baking in the oven is needed. The lemon curd is cooked on the stove top, but the oven is not required at all.